This page describes the god's divine attributes, estate and sacred animals. His standard attributes were a crested helm and war-spear. He was sometimes depicted holding a snake or with a serpent emblazoned on his shield. 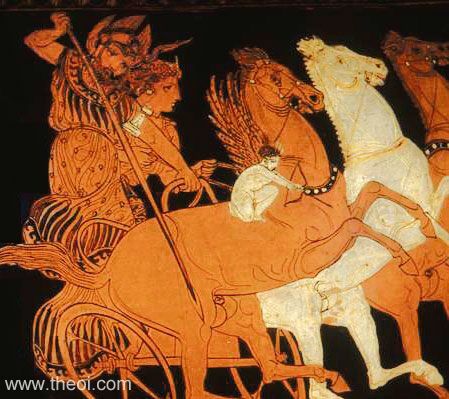 CHARIOT Ares drove a golden-reined chariot drawn by four fire-breathing horses. SPEAR Ares brandished a bronze-tipped spear in battle. ARMOUR Ares wore golden armour (helm, cuirass, war-belt, shield and greaves) which shone with a burning light. PALACE The palace of Ares stood either upon Mount Olympos (along with the other mansions of the gods) or upon Mount Haimos in Thrake. His Thrakian palace was an iron fortress adorned with war-booty and guarded by various divine sentries. SHRINE-GUARDIANS Several of the mythical shrines of Ares were endowed with monstrous guardians: - the Sacred Groves of Ares at Thebes and Kholkis each had a guardian Drakon; and the Sacred Amazon Island of Ares had arrow-shooting birds. SPARTI EARTH-BORN WARRIORS The Spartoi were armed warriors which sprang fully-grown from the earth, when the teeth of Ares' Guardian Drakones were sown in a field sacred to the god. EAGLE-OWL & BARN OWL Two species of owl, were regarded as sacred to the god Ares. They were birds of ill-omen, presaging war and sedition. 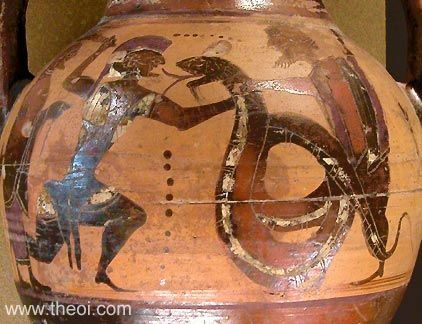 SNAKE POISONOUS The poisonous serpent was sacred to the god Ares. Several of his groves are described in myth guarded by these beasts, and in sculpture and art he often bears a serpent or serpent device. VULTURE The vulture was a bird of ill omen. Because it haunted the battlefield feeding upon the bodies of the dead, it was closely associated with the war-god Ares. WOODPECKER The woodpecker was a bird of good fortune believed to be sacred to the god Ares. So she spoke, and Ares gave her the gold-bridled horses, and, still grieved in the inward heart, she mounted the chariot and beside her entering Iris gathered the reins up and whipped them into a run, and they winged their way unreluctant. Now as they came to sheer Olympos, the place of the immortals, there swift Iris the wind-footed reined in her horses and slipped them from the yoke and threw fodder immortal before them." 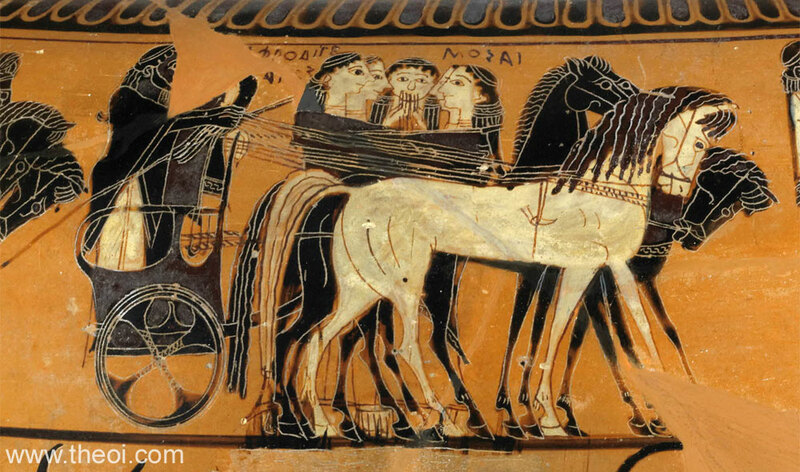 "[Ares] ordered Phobos (Fear) and Deimos (Terror) to harness his horses, and himself god into his shining armour." "Ares, god of the golden reins." "Ares insatiable in battle, blazing like the light of burning fire in his armour and standing in his chariot, and his running horses trampled and dented the ground with their hooves, and the dust swirled up around them, beaten up between the compacted chariot and the feet of the horses, and the well-put-together chariots and their rails clattered to the gallop of the straining horses." "And [depicted] on the shield [of Herakles] stood the fleet-footed horses of grim Ares . . . he was red with blood as if he were slaying living men, and he stood in his chariot. Beside him stood Deimos (Fear) and Phobos (Flight), eager to plunge amidst the fighting men." "Ares, exceeding in strength, chariot-rider . . . who whirl your fiery sphere [the star Mars] among the planets in their sevenfold courses through the aither wherein your blazing steeds ever bear you above the third firmament of heaven." "Murderous Ares came [to the battlefields of Troy], unmarked of other Gods, down from the heavens, eager to help the warrior sons of Troy. Aithon (Red-fire) and Phlogios (Flame), Konabos (Tumult) and Phobos (Panic-fear), his car-steeds, bare him down into the fight, the coursers which to roaring Boreas grim-eyed Erinnys bare, coursers that breathed life-blasting flame: groaned all the shivering air, as battleward they sped. Swiftly he came to Troy: loud rang the earth beneath the feet of that wild team." "Gradivus [Ares] . . . leaning upon his spear he leapt into his bloodstained chariot and cracked his whip and lashed his team and, plunging through the sky, stood on the sylvan peak of Palatium [in Rome]." "The Cyclopes were hard at work in the underground iron-foundry [of Hephaistos] . . . a job was being hurried on for Mars [Ares] - a chariot with swift wheels, such as he rides in to rouse up men and nations." "Iovis Terrorque Pavorque (Fear and Dread), the horses of Mars [Ares]." "Earth trembles, and horned [river] Hebrus bellows and stays his torrent's flow; then all the war-steeds that troubled the valley sped foaming o'er the frightened meads, sure sign of his [Ares] approach . . . Glorious in Hyrcanian gore he himself [Ares] comes riding by . . . with bloody hand dark Bellona [Enyo] guides the team and plies them hard with her long spear." "Loftily does the Bistonian [Thracian] steed bear Mars [Ares] when the fighting is done, exulting in the mighty weight, and swiftly flies by the river till he is all asteam and with his strong blowing stirs up the waves of Strymon [a Thracian River]." "There to the left of the fighting she found Ares the violent, sitting, his spear leaned into the mist, and his swift horses." "Ares led them [the Trojan army] with the goddess Enyo, she carrying with her the turmoil of shameless hatred while Ares made play in his hands with spear gigantic and ranged now in front of Hektor and now behind him." "Ares lunged first over the yoke and the reins of his horses with the bronze spear, furious to take the life from him [the hero Diomedes]. But the goddess grey-eyed Athene in her hand catching the spear pushed it away from the car, so he missed and stabled vainly." "His [Ares'] heavy hand [held] the bronze spear." "Ares the shield-stabber rose up against Athene with the brazen spear in his hand . . . and stabbed against the ghastly aegis with fluttering straps, which gives way not even before the bolt of Zeus' lightning. There blood-dripping Ares made his stab with the long spear." "And [depicted] on the shield [of Herakles] stood . . . grim Ares . . . He held a spear in his hands and was urging on the footmen: he was red with blood as if he were slaying living men." "Ares, screaming aloud, flourishing his spear like a flame, rapidly made his rush against the powerful Herakles, furious to kill him, and cast at him with the bronze spear in anger and resentment for his son who was fallen, and struck the great shield, but gray-eyed Athene, reached out of her chariot, turned aside the shock of the spearhead. The bitter sorrow closed on Ares, and drawing his sharp sword he swept in against Herakles the strong-hearted." "Ares came in from the battlefield brandishing a strong spear." "Into the battle's heart tossing his massy spear, he [Ares] came." "I [Ares] will take my Titan-destroying deathdealing spear." "[Ares] got into his shining armour . . . [but Athena] took the helmet off from his head, the shield from his shoulders, and snatched out of his heavy hand the bronze spear, and fixed it apart." "Where the war belt girt him [Ares]." "Ares insatiable in battle, blazing like the light of burning fire in his armour and standing in his chariots." "All the grove and the altar of Apollon Pagasaios were lighted up by the dread god, Ares, himself and his armour, and the shining from his eyes was like fire." "Drawing his sharp sword he [Ares] swept in against Herakles the strong-hearted, but as he came in Amphitryon's son [Herakles], insatiate of the terrible battle-cry, stabbed with full force into the thigh left bare under the elaborate shield, and twisting with the spear tore a great hole in the flesh, and beat him to the ground between." "Ares chariot-borne to murderous war fares forth, and round his onrush quakes the ground, while on the God's breast clash celestial arms outflashing fire." "Ares to the fray rose first, and on Athena rushed. Thereat fell each on other: clashed around their limbs the golden arms celestial as they charged." "From on high he [Ares] made a din as of thunder and smote his shield with the point of his spear, and it rang with a warlike noise. And the hills of Ossa trembled and the plain of Krannon, and the windswept skirts of Pindos, and all Thessalia danced for fear : such echoing din rang from his shield . . . such in that hour was the rattle of the fair-rounded shield." "This helmet that you see with chestnut horse-hair crest, this convex shield, my [the invulnerable Kaineus] left arm's load, they're not for my defence, they're for adornment. That's why Mars [Ares] too wears his armour. Strip their guardian services away--I'll leave the field without a scratch." "Barren forest [of Thrake], the sacred haunts of Mars [Ares] . . . where on the far slopes of Haemus his savage mansion is ringed by a thousand furies. The walls are of iron structure, iron portals bear upon the threshold, the roof is carried by columns wrought of iron. The rays of Phoebus [Helios the Sun] are weakened when they meet it, the very light fears that dwelling, and its murky glare dismays the stars. Fit sentinels hold watch there: from the outer gate wild Impetus (Passion) leaps, and blind Nefas (Mischief) and Irae (Angers) flushing red and pallid Metus (Fear) [Phobos], and Insidia (Treachery) lurks with hidden sword, and Discordia (Discord) [Eris] holding a two-edged blade. Minis (Threats) innumerable make clamour in the court, sullen Virtus (Valour) stands in the midst, and Furor (Rage) exultant and armed Mors (Death) [Thanatos] with blood-stained visage are seated there; no blood but that of wars is on the altars, no fire but snatched from burning cities. All around were spoils of every land, and captured peoples adorned the temple's high front, and fragments of iron-wrought gates and ships of war and empty chariots and faces ground by chariot-wheels, ay, almost even their groans! truly every form of violence and wounds. Himself [Mars-Ares] was everywhere to behold, but nowhere with softened looks; in such wise had Mulciber [Hephaistos] with divine skill portrayed him: not yet had the adulterer, made manifest by the sun's bright beams, atoned his shameful union in the bed's grasping chains [in which he was caught with Aphrodite] . . . The sacred groves of Ares at Thebes in Boiotia (Central Greece) and Kolkhis (on the Black Sea) were both protected by guardian Drakones. The first of these was slain by Kadmos, who had to serve Ares for eight years as penalty. The second protected the Golden Fleece, and was perhaps slain (or simply put to sleep) by Jason and the Argonauts. King Aeetes pastured bronze-footed, fire-breathing bulls on the sacred field of Ares. He instructed Jason to yoke these and sow a crop of armed warriors from dragon's teeth. "Rumour brought me tidings of you [Jason] . . . tidings that the sacred bulls of Mars [Ares] had received the curving yoke; that at the scattering of the seed there sprang forth the harvest of men, who for their doom had no need of your right arm." "I began to ask of your [Jason's] fortunes. He tells me of the brazen-footed oxen of Mars [Ares], how they ploughed, of the serpent's teeth scattered upon the ground in way of seed, of men sprung suddenly forth and bearing arms--earth-born peoples slain in combat with their fellows, filling out the fates of their lives in the space of a day." "The condition is imposed [by King Aeetes] that you [Jason] press the hard necks of the fierce bulls at the unaccustomed plow. To Mars [Ares] the bulls belonged, raging with more than mere horns, for their breathing was of terrible fire; of solid bronze were their feet, wrought round with bronze their nostrils, made black, too, by the blasts of their own breath." The sacred island sanctuary of Ares founded by the Amazones off the coast of their land in the Black Sea was guarded by a flock of arrow-shooting birds. "On the island of Mars [Ares] . . . Birds which shoot their feathers out as arrows." The Spartoi (Sown-ones) were earth-born warriors sacred to the god Ares. They were born fully-grown and armed from the soil, ready for battle, when the teeth of Ares' sacred Drakones were sown in the earth. Kadmos of Thebes sowed a batch of these warriors, of which only five survived. Another batch was sown by Jason at Kolkhis in his quest for the Golden Fleece. The Spartoi were regarded as sons of Ares, for the Drakones were children of the god, and the warriors seeded from them. "Zeus loathed them [the giants Agrios and Oreios] and sent Hermes to punish them . . . But Ares, since the family of Polyphonte [mother of the giants] descended from him, snatched her sons from this fate. With the help of Hermes he changed them into birds. Polyphonte became a small owl whose voice is heard at night. She does not eat or drink and keeps her head turned down and the tips of her feet turned up. She is a portent of war and sedition for mankind. Oreios became an eagle owl, a bird that presages little good to anyone when it appears. Argios was changed into a vulture, the bird most detested by gods and men. These gods gave him an utter craving for human flesh and blood. Their female servant was changed into a woodpecker. As she was changing her shape she prayed to the gods not to become a bird evil for mankind. Hermes and Ares heard her prayer because she had by necessity done what her masters had ordered. This a bird of good omen for someone going hunting or to feasts." The poisonous serpent was sacred to Ares. In ancient art he was often shown holding a serpent, or with a serpent-device on his shield.